I recently tried Google WiFi and Ubiquiti’s UniFi access points at my office (30-40 clients), and Google WiFi at home (10 clients). Here’s my experience after years of Airport Extremes and DD-WRT routers. I impulse bought directly from Google, and missed this top Amazon review. The author is spot on. Here’s how my ignorant experience unfolded. Unpacked box and downloaded Google WiFi app. 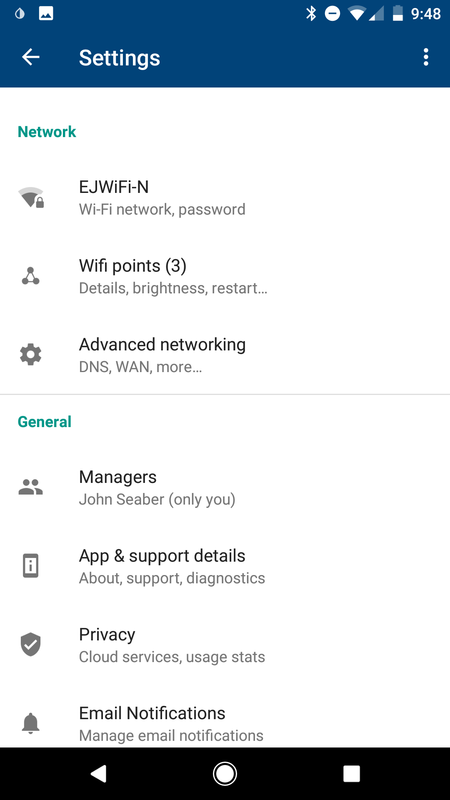 Connected a single Google WiFi pod to WAN and LAN of business network, observing Google’s note to only connect a single node during setup. More mandatory waiting and rebooting…. …app still can’t establish Internet connection, and suggests I reach out to Google support. I knew the problem throughout this process, but was curious how the app would guide me through the setup process. Basically, the app wasted my time, gave up, and advised talking to another human. Really, Google? The office cable line uses a static IP, which must be manually configured (no DHCP from the ISP). I trusted the app would detect the simple problem and ask me to manually configure my connection. I had to escape the setup process and dig into Advanced Networking settings to get online and resume setup. Study these screenshots carefully before investing in Google WiFi. If there’s anything special you require of your routing environment, note this is the full extent of advanced functionality available in Google WiFi as of September 2017. 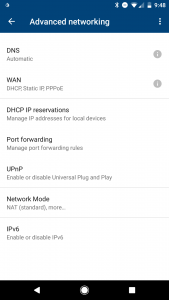 Google WiFi’s default LAN IP of 192.168.86. * cannot be modified, despite nearly a year of user requests. This was a a deal breaker at the office, which relies on DHCP reservations on a local LAN IP range of 10.0.1. * for printers, servers, etc. It’s a huge time commitment to manually reconfigure static devices for 50 clients. Upon realizing this limitation, I boxed up Google WiFi for a spin at home. EDIT – December 2017: Google has finally enabled the ability to change LAN IP. 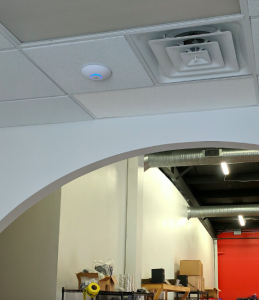 Netgear’s Orbi and Ubiquiti’s Amplifi-HD each looked interesting, but after the Google WiFi disappointment, I abandoned the idea of employing another consumer grade WiFi router in our small business office. A colleague suggested Ubiquiti’s UniFi UAP AC LR, so I began reading reviews this time around. If you read anything in this article, and possess above average networking knowledge, you want a UniFi AP. All of the consumer grade mesh routers today are first generation devices. Google WiFi is severely limited by its app functionality, Netgear’s Orbi has no wired backhaul support, and Ubiquiti’s Amplifi-HD is a higher priced consumer version of the same company’s more advanced enterprise WiFi line, Unifi. Ubiquiti is wise to brand Amplifi-HD separately to the consumer market. I’d skipped over enterprise WiFi options for years, believing anything “enterprise grade” would be overkill for a small office. Yet, WiFi has been a struggle since we moved into our 8000 sq. ft. facility, even with Apple’s Airport Extreme. UniFi setup was a dream. 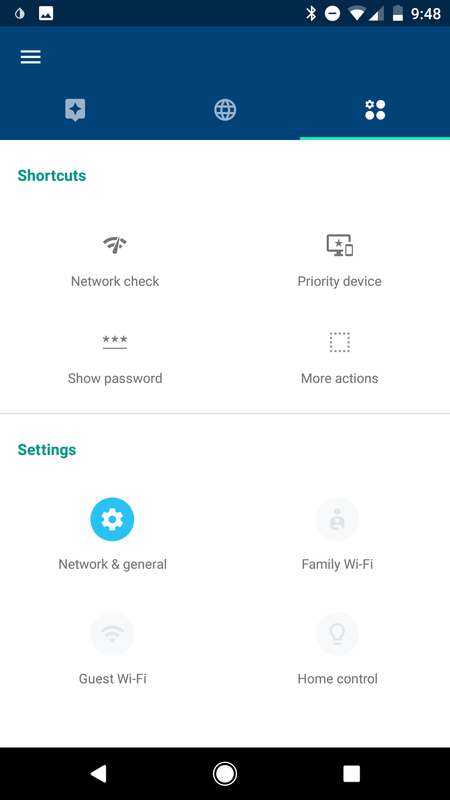 I installed the UniFi controller on our local server, created an admin account, and entered our WiFi SSID and key in about the same time it took to download and login to the Google WiFi app. Physical mounting was admittedly trickier than a consumer grade router, but the stealthy ceiling install is well worth the effort. It looks like a smoke detector with a blue light. UniFi APs are powered by 24V PoE. While Ubiquiti ships a PoE injector with each AP, I ended up investing in a new UniFi 16 port switch to gain native PoE capability as well. Completing setup was a matter of clicking “Adopt” in the Devices list of the Unifi Controller. That’s it. No fighting new router configurations, no surprises, it just worked. I was immediately impressed by the UAP AC LR’s performance. All clients throughout the 8000 sq. ft. facility connected easily, slightly exceeding coverage of the previous Apple Airport Extreme. Nevertheless, it was too easy to add a second UniFi AC Pro on the opposite side of the building to improve 5G coverage throughout offices with heavy WiFi streaming traffic. I connected the second AP in a similar fashion, clicked ‘Adopt’, and was done. Mesh activated. The UniFi system is nothing short of amazing. It was painless to install in an office setting, performance is excellent, administration options are powerful, and the price is lower than the best consumer grade mesh systems (a bargain). UniFi is a serious AP that requires wired backhaul. You’ll need ethernet ports strategically located throughout your house. The UniFi Controller is mandatory. Either run the application on a local server, or buy the UniFi Cloud Key (more $$). Ceiling mounted APs at home may or may not be feasible. I’m a fan. I’ve been using Google WiFi at home for a couple weeks, and my opinion is more favorable in its native environment. Wireless should just work. 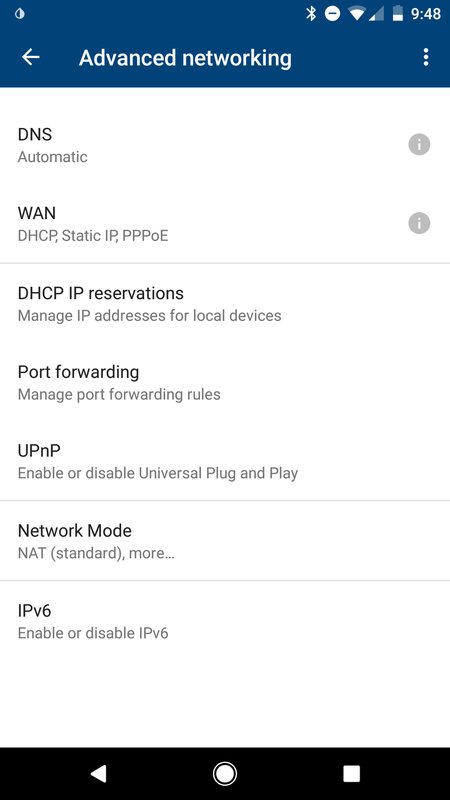 At home, I have no need for DHCP reservations, static IPs, or servers, so the minimal network configuration options are fine here. Still, the Google WiFi Setup remained clunky in my simple home network. After resetting the first node, I managed to confuse the Google WiFi Setup process again. It demanded that I reboot my modem, reset the Google WiFi, and wait for 2+ minutes. When the second node also would not connect, the app again advised that I reach out to support. Nonsense! The second and third nodes simply took longer to reset than the app predicted since they’d been previously setup for a different account. Overall, it took about 15 minutes running up and down the staircases to establish Google WiFi. GaleForce opens up the possibility of customizing the system and alleviating many of my frustrations with Google WiFi. I may try this out for the sake of experimentation. Even so, I’ll be sticking with Unifi for business. I built my first wireless mesh in 2012 using DD-WRT between two routers. Wired backhaul, IMO, is the right way to build a high-performance mesh system (why waste wireless bandwidth?). Google’s consumer marketing is rather vague, and the setup process instructs to keep the second and third nodes unplugged from Ethernet during setup. Therefore, I’d initially assumed there was no wired backhaul support, like Netgear’s Orbi. Google Wifi’s backhaul functionality is actually a step ahead for home deployment. Each node automatically selects the fastest available connection. Wireless backhaul will take precedence over wired backhaul if the wired connection is found to be slower (i.e., 802.11ac may outperform a 100mbps switch). Nice! On wireless backhaul sitting next to the second node, speedtest.net returned 47.90 mbps down. On wired backhaul in the same spot, the same test returned 131.86 mbps down (Charter 100mb cable). Although this is a single test point and not too scientific, I’m sitting in my favorite chair, so it does seem that wired backhaul is worth the effort. 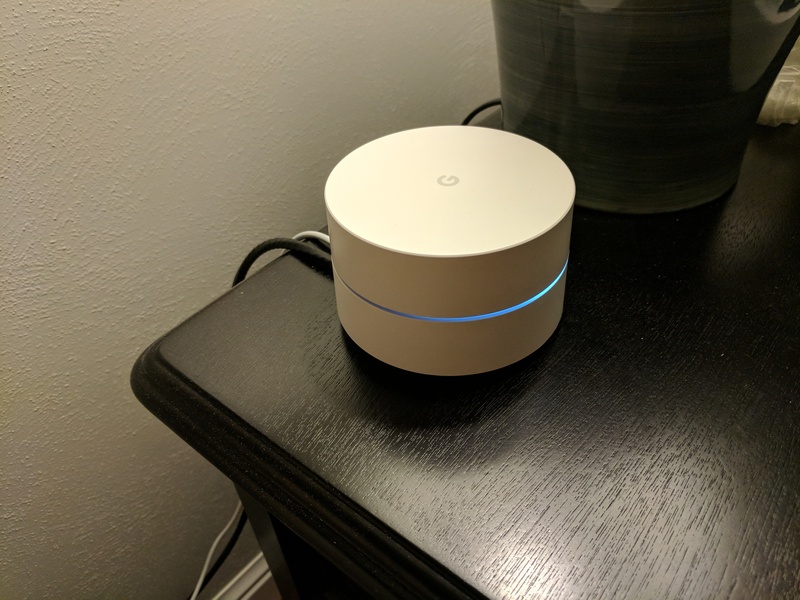 Google WiFi is a solid option if you have no special network or routing requirements. Its automatic wireless or wired backhaul gives it flexibility and a potential throughput advantage over other consumer mesh routers. For anyone with even slightly advanced network requirements (such as a LAN IP other than 192.168.86. *), skip the first generation consumer mesh WiFi options and look at Ubiquiti’s UniFi access points. I am thinking of buying the Google Wifi but not yet decided, I have used Ubiquiti in the past and it seems to do the Job for my clients. You think the Google wifi with Mash network would be ideal for the home environment? They have since update firmware which allows the Google Wifi LAN ip to be changed. Check it out. Thanks, I added a note to the original post. This is great, I am using a few Google products at home like the NEST, I installed one of them now for a client spread over 2 floors and extension and it is good. Also, Google uses its own DNS (allot faster and secure then the BT and other ISPs), which is fast and I would love to see the ability to Block sites via DNS. Its a shame that in the area she lives in Surry, she only gets 2meg ADSL. I have asked her to write to the CEO of BT regarding the speeds of the internet and if they can add fiber to the area but we will see. I want to wait till a friend comes from the USA and get the 3 pack, as in the UK they always charge us more for less. You get 3 pack in the USA for less, the UK 2 pack is more expensive. Thanks for the info, migrated from Apple Airport at home to Google Wifi and was pretty pleased, have an ongoing iPad dropping out but not sure why… just living with that. At work, open plan office and artists studios, limping along with various AEs dotted about and have one UAP to test, though now reading this, my mind is made up. Take the plunge and go all in for the UAPs! 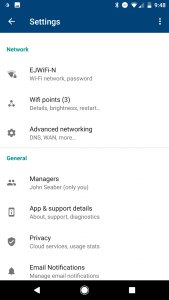 I have 3 Google wifi networks in 3 locations. I can reset any network as a whole, or any one node. 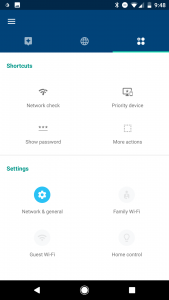 I can see every device that connected, and trigger events to occur in any hone using IFTTT (turn on lights when elderly mother’s phone connects at 3a). I can not just talk my sister 4 states away through the process of pausing her kids Xbox & Tablets for bedtime or dinner – I can just do it for her real time. program one bedtime to pause all the 9 year olds devices, and another later bedtime one for the teenagers phone and game console. I can do all this, in seconds, with an intuitive easy to use interface. I can perform bandwidth tests on the whole network, and on every node, telling me where my backhaul needs tweaking. Because Google wifi data is integrated with Google maps, I can generate precise location and mapping data – because for example my rural network has 5 nodes, all which are tracked in Google maps, allowing precision location acquisition at any point on the property. In short, no other system is this intuitive, this flexible, this “smart”. There’s no comparison – Google Wifi is a winner. It does things other mesh systems, other networks simply can’t do. Otherwise systems may outperform marginally in a particular environment type (suburban home with limited interference), but in the REAL WORLD people are living in crowded wifi spectrum environments. Only Google wifi has the device network switching and channel selection algorithms to push performance to the max in ANY environment. Unifi AP’s support wireless uplinks between AP’s as well. I’m wrestling with a similar decision. However, given that you can get Google Wi-Fi three-packs for $240-$300, and a Ubiquiti setup is looking to run me about $1k total, they’d better be in entirely separate leagues to justify the price difference. Run the controller on an existing PC or $40 RPi. I gave away one of the 3 Google WiFi pucks. Two cover my house fine. Our 8000 ft^2 building can get away with a single AP-AC; two is already overkill. folks are not shy about lying with other people. himself towards the same dating site.